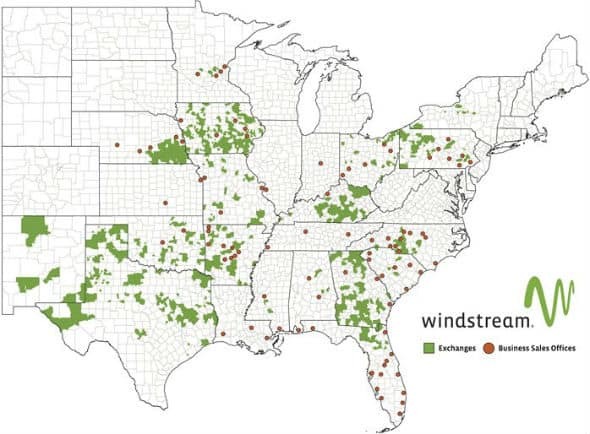 Windstream is relying on the Federal Communications Commission’s Connect America Fund to double the areas where it will offer 100 Mbps broadband service, expected to reach 30% of the company’s 18-state local service area by the end of the first quarter of 2019. Thomas told attendees at the Citi 2019 TMT West Conference Windstream’s legacy copper wire telephone network is not up to the job of handling the kinds of internet speeds more modern technologies can manage. In urban and larger service areas, Windstream is most likely to deploy fiber to the home service in new housing developments and select gentrified neighborhoods where a business case exists to invest in fiber upgrades. The company also typically replaces its copper wireline infrastructure with fiber where road construction projects or damage forces the company to replace or relocate its lines. Suburban and more densely populated rural areas are likely to receive an upgraded version of Windstream’s DSL service that can manage up to 50 or 100 Mbps. In Windstream’s significant rural service area, the phone company is increasingly turning to fixed wireless technology, especially in flat midwestern states like Nebraska and Iowa where it plans to offer a combination of 3.5 GHz “CBRS” and 5G millimeter wave fixed wireless broadband capable of delivering up to 1,000 Mbps. “[We are deploying wireless internet] probably at a larger scale than a lot of the larger wireless companies,” Thomas said, especially in flatter areas where wireless signals go a long way. Because most current broadband expansion fund programs require companies to commit to at least 25/3 Mbps service, simply expanding basic ADSL technology has proven inadequate to meet the government’s speed requirements. But wiring fiber to the home service to get faster speeds in rural areas does not meet the Return On Investment requirements Windstream’s shareholders demand. Windstream claims fixed wireless can solve both problems. As of early 2019, Windstream claims that 60% of its customers can get at least 25 Mbps service, 40% can receive at least 50 Mbps service. By the end of March, 30% will be able to receive 100 Mbps service. Windstream has our house in rural Ashtabula County, OH on its list of addresses that were upgraded (in 2016) with its $175 million in CAF II subsidies. This means the minimum speed available is supposed to be 10/1 Mbps. And if you check our address on Windstream’s website, you’re now told the standard service speed is 10 Mbps. Not that great for $75 a month — but twice the download speed we’ve ever seen. Our house is a third of a mile from Windstream’s fiber on Route 7, there are three Amish neighbors between us and that fiber (whose addresses are also listed as CAF-improved! ), and we’re three miles from the central office in Pierpont. So we weren’t unhappy to get 5 Mbps service in 2013. We don’t expect miracles. Also, Windstream has installed a handful of new fiber-fed remote DSLAMs in nearby townships served by that central office. So I suppose somebody is getting better service from that CAF money. Happy for them. But whatever they’ve been doing, it hasn’t gotten our house any closer to 10/1. And presumably being on that list makes our address ineligible for any future CAF-supported improvements. Just a little context for Windstream’s press releases. We live in a small town of around 8000 plus. We pay for the highest speed available. Our Prime, Netflix, and Hulu constantly say insufficient bandwith. Your bandwith is to low and this may cause your video to repeatedly pause. Yep. MOST expensive game package and we can’t download games without it taking at times over 2 days. Windstream lies. It is a deceitful company. We found a clause in our contract that states they don’t grantee we get what we pay for. This way we can’t sue. They are good at covering themselves and bilking their customers. If I did thus to someone else I would be charged with fraud. Pay enormous fines and restitution plus go to jail. Maybe that is what needs to happen to the owners and those in charge of the company, should have done to them. They are thieves. Taking money from people and not providing them with what they pay for. Pure scam artest . That is what they are.